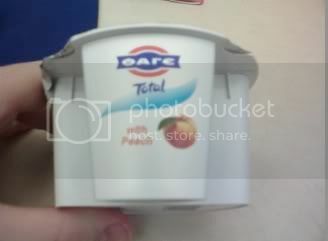 In English letters, it's 'Fage' and seriously, it is like...it's like...I don't even know what it's like. It's yogurt with a little pot of fruit stuff to mix into it, except some Greek god--isn't it Demeter that was the goddess of food or harvests or cornucopias or something or other? Again, someone google and/or wikipedia this and get back to me, I can't be bothered--has managed to work some sort of weird occultic Greek mythology magic on it so that it's more like buttercream frosting, except good for you and with like, "active yogurt cultures" or whatever that sort of horrifying-sounding phrase that's always on yogurt packaging is. It's seriously so good I can't even stand it. In fact, I have to end this here. I'm getting too worked up. Oh, the cherry variety has a vague undertone of Robitussin. You've been warned. interesting point, your article is great!! well done! !